Hey, all you Modern Recordists! I’m SUPER excited to bring you a MONSTER of an episode. 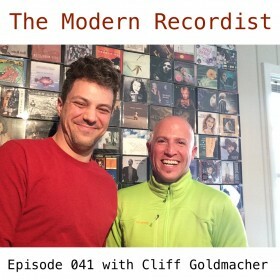 This one is heavy-hitting, and full of knowledge bombs from songwriter, producer, author, and educator, Cliff Goldmacher. Cliff has been in the business of songwriting and music making for more than 20 years. Throughout his career, he has worked and collaborated with up and coming songwriters, multi-platinum selling artists, and GRAMMY award winners. He’s had songs cut by major label artists in country, pop, and jazz, and his song “Till You Come To Me” went #1 on the jazz charts. Some of the artists and songwriters Cliff has worked with include, Keb Mo, Ke$ha, Lisa Loeb, Chris Barron of The Spin Doctors, and Mickey Hart of The Grateful Dead. On this episode, Cliff and I talk about what it takes to build a prolific career in the music business over the long game. And that only scratches the surface. Hit play and listen now to soak in all the knowledge Cliff drops on us! Also, Cliff has a special link for you to his online courses on songwriting, which include a 30 day trial of Lynda.com. Click or tap – http://Lynda.com/CliffGoldmacher – to get them now. Make sure you connect with Cliff at his website – www.cliffgoldmacher.com – to follow up, get links to more songwriting resources (such as his book), as well as any production and/or recording needs you may have. Let’s all join together in this growing tribe we have going here, and make a big boom at the beginning of the year. Let’s set ourselves up to have a big show this year, getting more great guests to come on the show. First – Get subscribed and stay subscribed. Jump over to iTunes, search for The Modern Recordist, and hit that subscribe button. Second – Jump over to iTunes and leave a rating and review. Good and honest ratings and reviews communicate the value to new listeners as they find this podcast in the iTunes directories. Third – Share this podcast with a few friends. If you’ve gotten something out of this show, and know some friends who would also get something out of listening to this podcast, go ahead and drop a link in an email or text and tell them about it. That’s it for this week. There’s more for you next week. In the meantime, go live your life of an extraordinary artistic visionary, and create something impactful the world! Listen to EP: 041 Now!